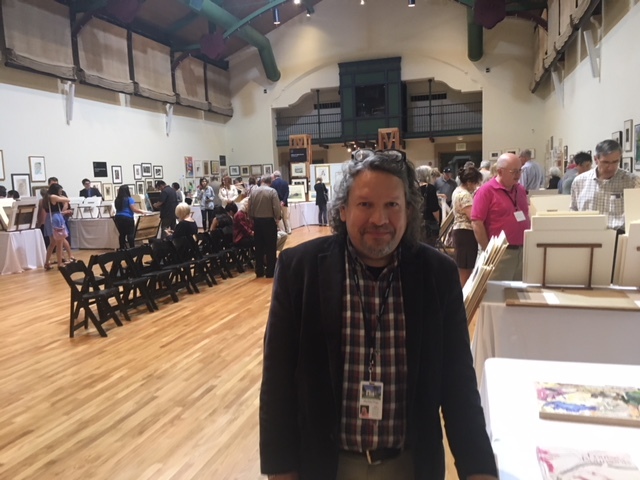 I had heard great things about the McNay Print Fair from other print collectors and my friends at the Amon Carter Museum. Most of my print purchases have been through auctions, but having the input and knowledge of print dealers was a missing piece. 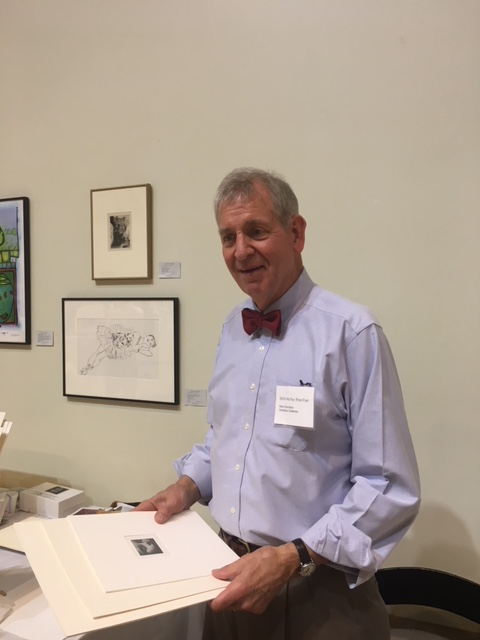 The Print Fair lasted two days – March 3 and March 4, 2018. I chose to make the drive to San Antonio on the Sunday – March 4th. Aided by a good Audible book (Ron Chernow on “Grant”), it was an easy 4 hour drive to the McNay. The 2018 event was the 22nd annual. Thirteen dealers were in attendance. The Sunday crowd was moderate (which made it easier to look at prints). I was told the crowd was substantial on Saturday – particularly at the Reception on Saturday night. Every dealer I visited with was pleased with their participation. Susan Teller worked at Associated American Artists from 1973-1988. For the first ten years she worked with another of the most important people in AAA history – Sylvan Cole. Cole was a major part of the American print world for many years. He knew everyone – artists, collectors, museum directors, curators and dealers. Much of Susan’s chapter in the book focuses on his positive influence on her and the other employees at AAA. When my father, Charles Rosenthal, was doing research on his print collection, he contacted Sylvan Cole regarding valuations of the prints. Eventually, this led to a connection with the Phoenix Art Museum and his donation of much of his collection to that institution. In the early years, the AAA was essentially a mail order business. Initial sales were made to customers through full page advertisements in popular American magazines like Life Magazine. After the initial sale was made the names and addresses of customers were embossed onto metal plates. (The major manufacturer of these plates and the equipment to use them was a company called Addressograph.) The addresses for customer mailings were printed on envelopes or labels using these plates. 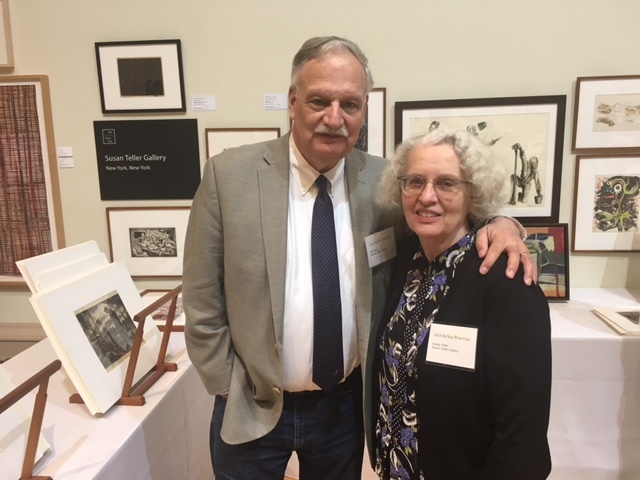 I had a nice visit with Susan at the Print Fair. By the time Susan arrived at AAA, the response rates on their mailings had started to decline. Apparently, customers were divided into at least two classifications – frequent buyers (collectors) and regular customers. Mailings to frequent buyers were sent First Class. The regular customer mailings were sent Third Class or Bulk Rate. The Bulk Rate mailings were becoming increasingly expensive and less responsive. Susan was the one who ran the test to show that money was only being made on the First Class mailings to frequent buyers. From that point forward all mailings were done First Class. As I was going through the Print Fair, I was introduced to Lyle Williams. Lyle is the Founder and Head of the event. He is also the McNay Curator of Prints and Drawings. During our very pleasant visit, I asked him how he got interested in prints and works on paper. He said it all began when he was in school and his parents had this friend by the name of Sylvan Cole (yes – the same AAA Sylvan Cole) who would invite him to spend weekends with his family at their country house. Mr. Cole had such a profound influence on him that he changed his Major and has been involved in the “print world” ever since. The McNay has a very fine print collection thanks to Lyle’s diligent work. I also had a great visit with Dan Lienau of Annex Galleries. I have been on Dan’s “Print of the Day” email list for the past several years. Each print is reproduced along with an explanation of the piece and the artist. This is a great marketing tool for Annex Galleries – but also educational and enjoyable for the recipients. Annex Galleries specializes in the works of Gustave Baumann. In fact, Dan’s wife, Gala Chamberlain, is working on a catalogue raisonne of Baumann’s work. The book is soon to be published. I look forward to buying one of the first copies! As it turns out Dan and Tom are friends. The small world of prints gets even smaller. In summary, the McNay Print Fair was well worth the drive to San Antonio and back in one day. It is an excellent event. Well organized. Good print galleries represented. Lots of nice people. I will be back in March of 2019 for the 23rd! This is such a wonderful piece. Thank you so much. 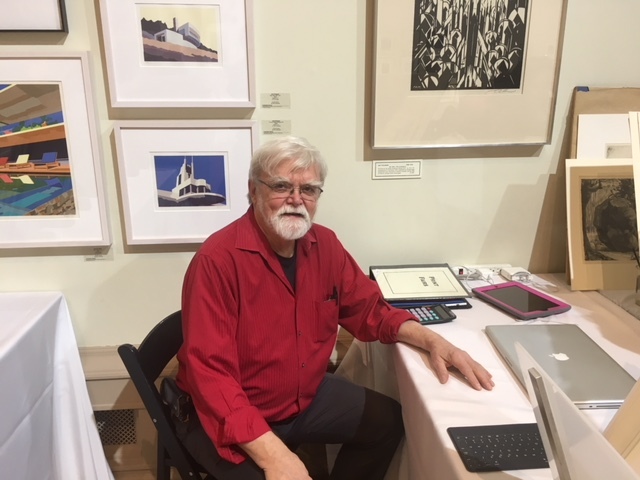 Your visit at the McNay Fair this year was definitely a highlight and the kind of happy, unpredictable thing that being out in the world, well, the Print World, can make happen. Sometimes when I talk to people about AAA and Sylvan Cole I get a little nostalgic, but you brought such an interesting point of view that I felt like I gained another insight entirely. Thank you for your visit and this terrific review of the fair as well. The McNay is a shining example of what a regional fair can be. Of course it is a bit shocking to read “Easy 4 hour drive,” but I know you meant that in the nicest way possible. See you next year? Thanks. It was a pleasure visiting with you and learning more about AAA. I am glad you enjoyed our conversation as well. A good audio book is a must for a car trip. “Easy” might not be the perfect word but the time passes quickly. Yes, I will be back at the McNay Print Fair in 2019. I am looking forward to it. Jim – a wonderful article. I’m anxious to share your burgeoning website with friends. Peter – Thanks. Your positive comments and support are much appreciated. The 23rd McNay Print Fair is coming up on March 2 and 3. I plan to be there and to enjoy the excellent prints, the knowledgeable dealers and the great atmosphere of the McNay Museum. It is well worth the time and effort to attend.